On 15th June 2014, I had a very tearful goodbye with my parents at Heathrow airport, not to see them again until 9th September. 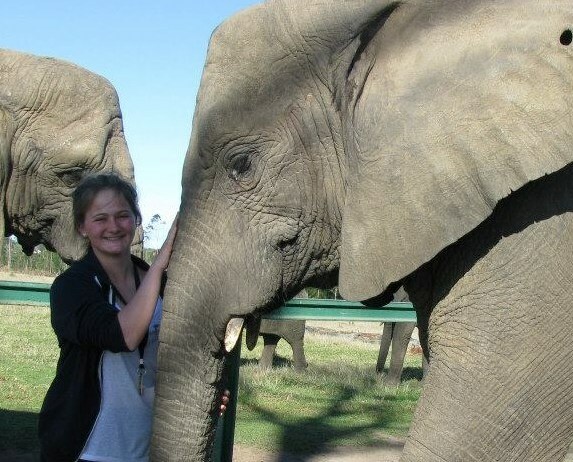 I spent three months as an elephant volunteer in South Africa and it was the best time of my life. The trip was many “firsts” for me: first time flying alone, first voluntary project, first time out of Europe, first experience of independent living – it’s safe to say I was pretty nervous before I left and didn’t really know what to expect! However Anne from Oyster Worldwide was very helpful in preparing me for my trip, organising things for me and advising flights/insurance etc. and answering any questions I had about my time in South Africa. My nerves were mostly calmed by the time it came around to leaving day. I could write pages and pages of great things about the trip itself, but it would probably be better to keep it as short as possible for any future volunteers that could be reading this – you’ll have to go and experience it all yourself! The project itself is volunteering for a research unit, and it’s honestly a very rewarding feeling knowing that the work you do is so useful. The majority of your time is spent observing the elephants, collecting and later on entering data. This data is used by staff to monitor all the elephants, checking that they are healthy, happy, socialising, eating enough food (which you’ll come to learn is rarely an issue with elephants!) and other general behaviours. There is also a lot of work in planning, making and providing enrichments for the elephants, which can be “toys” or any form of food treat. In the three months that I spent at the park, I was lucky to be a part of two of the ellies’ birthdays, Mandela Day and World Elephant Day; all of which we made yummy treats for the ellies and tried to get the public involved. Then, there comes all the up close and personal experience you get with the ellies, both when working and in your free time. I’ve always been fascinated by elephants and it really was an amazing experience being so close to the two herds , and actually feeling like I had a bond with some of them. There was never a dull moment with them, and every day brought something better. I miss South Africa, the people I met out there, and of course all of the ellies a lot, and I would love to go back one day, so I’m excited to see what the future holds. And lastly, I had a great social life. I wasn’t expecting it, but there’s great night life in Plettenberg Bay! So if that’s your thing then you’re in for a treat. If it isn’t, there are plenty of nice restaurants around town to enjoy a quieter night out, or very comfy sofas at the park to enjoy a quiet night in. So, if you ever find yourself with nothing to do in your time at the park, really, it’s your own fault!